Despite the many adventurous things to do in West Sumatra, you may often find yourself the only foreign traveler in sight. Never mind the low prevalence of English: locals love to interact. And fortunately, they’ve swapped blowguns for smartphones. The far side of Indonesia’s largest island has somehow remained off the backpacker radar in Southeast Asia. Meanwhile, other adventurous-yet-accessible places are being trodden to a muddy pulp by tourists’ boots. West Sumatra offers a quiet challenge for travelers not afraid to step up. It’s no Bali. Don’t expect chocolates on your pillow — you’ll do your own turndown service to check for bedmates with too many legs. Buses and rough roads offer free chiropractic adjustments. The driving in Sumatra terrifies even the most seasoned drivers in Asia. But braving the equatorial heat and road chaos is incredibly rewarding — especially for adventure seekers. Sumatra ranks alongside Borneo in thrilling natural wildness. The two also have something else in common: they’re the only islands in the world with wild orangutans. Easy accessibility, indigenous culture, geothermic lakes, fern-tangled valleys, undeveloped beaches, climbable volcanoes — all the ingredients for a memorable adventure are there. 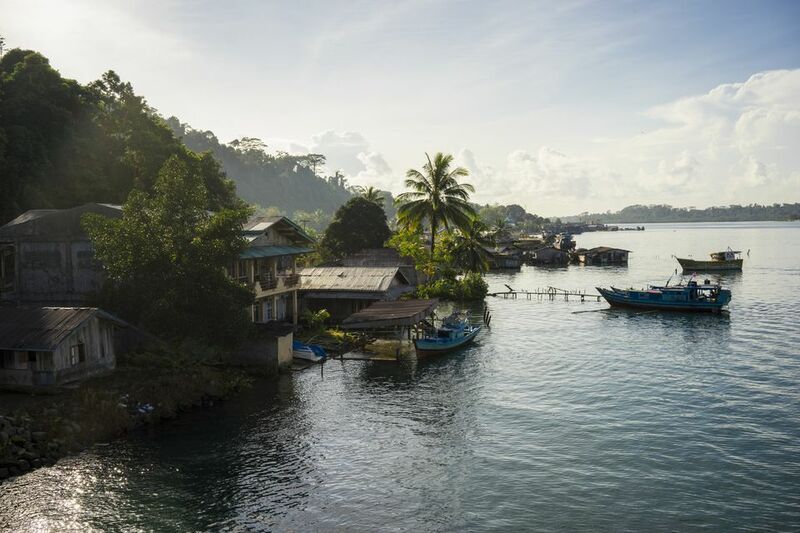 But for now, most of Sumatra’s non-surfing visitors end up in Bukit Lawang to see orangutans or Lake Toba to enjoy the largest volcanic lake in the world. Only an intrepid few wander south to glimpse at the rest of Sumatra. Getting There: No need to swing a machete through the jungle. Flights from Kuala Lumpur and Jakarta take around an hour and cost less than US $50. The town of Bukittinggi (population: 117,000) serves as a convenient, walkable base for exploring the region. The popular Hello Guesthouse on Jalan Teuku Umar can provide motorbike rentals, maps, and excellent advice for organizing adventures. The verdant Harau Valley is around two hours north of Bukittinggi by motorbike. You can certainly catch a ride, but having your own two wheels opens up additional adventures. Waterfalls abound, as do vibrant rice fields and impressive rock outcrops. Some short hikes are available in the area, but the real reason to visit the Harau Valley is for the scenery. After too much time on dirty concrete in Padang or Payakumbuh, the sprawling green of the valley will make you tear up. The Abdi Homestay is a good place to begin in Harau Valley. The rustic bungalows are set in spectacular scenery. Accommodation is limited in the area; call ahead (+ 62 852 6378 1842). Before You Go: Although driving to the Harau Valley begins with the feeling of entering the wilds of Sumatra, don’t get too used to it. You’ll need to push through bustling Payakumbuh, the second largest city in West Sumatra, just before reaching the valley. Sumatra is a glorious, volcanic playground for adventurous travelers. There are some impressive options on offer. Bukittinggi sits precariously nestled between two volcanoes — who thought that was a good idea? Visiting the island without “bagging” at least one gunung would be regretful. The most popular choice is to climb Gunung Marapi. At an elevation of 9,485 feet, Gunung Marapi (“Mountain of Fire”) is 3,000 feet less daunting than Gunung Kerinci — the tallest volcano in Indonesia. Regardless, you’ll have to work for every inch gained as you claw and scramble your way up the steep trail and brittle lava field near the top. Unlike its taller Sumatran brother, Gunung Marapi can be scaled in one long day (8-10 hours) with a sunrise start. Although Gunung Marapi isn’t far from the equator, the top gets chilly. The black, sandy wasteland of the crater complex feels otherworldly and stinks of sulfur. Using a guide is optional for experienced hikers and climbers. The trail is tough but easy to follow and starts just 45 minutes from Bukittinggi. Go on a weekday if possible; locals love to camp and party there on weekends. Before You Go: Gunung Marapi in Sumatra is often confused with Gunung Merapi in Java. Pay attention when doing online research. Both are pronounced the same but spelling matters! The backpacker adage of “always visit islands last because you may get stuck” also applies to Lake Maninjau. The big crater lake 22 miles west of Bukittinggi certainly encourages lazy days of reading, fishing, and recovering leg muscles after a tough volcano climb. Although Lake Maninjau certainly can’t compete with Lake Toba in North Sumatra for size or popularity, it has plenty of its own charm. The big lake takes over an hour to circumnavigate on motorbike and averages 344 feet deep. Even better, it’s full of fish! The unlucky-but-delicious ones end up on offer in nearby eateries. The scenic road that descends to the lake has ample cafes and overlooks for enjoying the vistas. Driving to the backside of the lake reveals beautiful scenes of daily life that have nothing to do with tourism. Before You Go: The Beach Guest House / Bagoes Cafe is a good option in the area. Accommodation isn’t luxurious, but the food, Wi-Fi, and extras (canoes, fishing, and advice) are excellent. The beach strip of brick and pebbles right in Padang isn’t very idyllic. Rocks, rubbish, and traffic noise discourage lingering longer than grabbing a fish lunch at one of the many ikan bakar stands. Air Manis Beach or Bungus Beach are better options, but perhaps still a bit too close to the hustle and bustle. If you’ve got the time and energy, you can enjoy a very remote beach bungalow experience south of Padang where jungle meets coastline. Getting there requires a bit of patience, but you’ll be rewarded with a beautiful respite from Padang. The Rimba Ecolodge is a French-Indonesian run operation far from the reach of Sumatra’s persistent traffic. Forget about Wi-Fi or phone service. This isn’t the place to cull a social-media empire; it’s a place to disappear. Electricity is available for only a few hours per day. You’ll hardly notice as you snorkel, trek in the jungle, and read in a hammock. If you’ve ever wanted to try life on a private jungle beach, this is your opportunity. All meals and unlimited coffee/tea are provided for a very reasonable price. Good thing — there isn’t anywhere else to go! Before You Go: Rimba is only accessible by boat; visitors often leave from the Tin-Tin Homestay in Bungus. Call +62 888 0740 2278 or check http://www.rimba-ecoproject.com/ for availability before risking the boat. It’s going to take a lot of good timing — and a bit of luck — to catch a seasonal pacu jawi (cow race) event in West Sumatra. The effort is well worth a chance to witness this unusual cultural event. Have you ever wanted to see what happens when a man bites a cow’s tail? This is your chance. Villages take turns hosting races; locations and times rotate. You’ll need to ask around to find an event, then rent a motorbike or arrange transportation. The races celebrate the end of the rice harvest and serve as a rare opportunity for socialization between rural villages. Quirky, chaotic, and fun are the only ways to describe pacu jawi. Races are anything but orderly; teams go when ready. Cows aren’t harnessed together and often get away from jockeys or pull his legs in opposite directions. Mud flies. Crowds taunt and cheer. Horns blare. Find a good spot to watch, then stay on your toes for any runaway steers that may head your way! The event is one big social hangout with lots of mud involved. Don’t worry: the ploughing cows aren’t harmed and are cleaned up to be auctioned off after the races. Before You Go: Take a hat, sunscreen, and umbrella. Pacu jawi events are held in rice paddies under the equatorial Sumatran sun. There will be little or no shade available! If you’re already a renowned volcano scrambler and Gunung Marapi’s 9,485 feet seems a bit like the Little Leagues, look no further: Mount Kerinci, not far away, is the tallest volcano in Indonesia. At 12,484 feet, Mount Kerinci doesn’t seem too daunting when matched up against the massifs in places such as Nepal. But climbers learn the hard way that powerful wind near the summit can literally halt progress and visibility. Perpetually cold rain, mud, and generally nightmarish conditions except on rare days mean that you’ll have to earn this one — and take a guide. Independent trekkers have disappeared there in the past. Bagging Indonesia’s tallest will take two days and an overnight. The setting of the Kerinci Seblat National Park only adds to the excitement — Sumatran tigers and rhinos live there! Before You Go: Along with a reliable guide, you'll need to take warm clothing for the overnight. If you didn't expect to get cold in Sumatra (it's ordinarily scorching), hit the second-hand clothing markets in town for cheap flannel shirts. If you're willing to splurge, a couple of outfitting shops in Bukittinggi carry fake and authentic Gortex shells. The 70 or so Mentawai Islands off the west coast of Sumatra are home to the Mentawai people, an indigenous group of hunter-gatherers. Although modernization has long set in, and loin cloths are usually swapped for jean shorts, the Mentawai culture is both fascinating and disappearing. Customs include traditional tattooing and sharpening of the teeth. The Mentawai Islands have been a favorite of serious surfers for decades. The unforgiving, world-class waves break over reef and rock. Needless to say, it’s no place for newbies. Head to Lombok or Kuta, Bali for lessons instead if you’re not yet an expert with a board. Even if you don’t plan to chase glory on the break, there are plenty of activities on shore. The Mentawai Islands are growing increasingly alluring as an alternative adventure destination. Intrepid travelers are going for trekking, diving/snorkeling, to learn about indigenous culture, and yes — to get traditional tattoos. Before You Go: The 2017 documentary As Worlds Divide depicts life within a Mentawai forest community.